The school's founding on 28 January, 1920 marked the establishment of the first purely Afrikaans-medium school in South Africa. This event predated the official recognition of the Afrikaans language by five years. I was wondering: what did they use for textbooks? Were there mathematics books, history books, geography books, etc., written in a language still five years from being "official"? There's very little information on the actual formation of Afrikaans, both in written and spoken form. The Volksblad for instance was regarded an Afrikaans newspaper, but seems to be closer to Dutch than modern-day Afrikaans. The reason for this is that both Cape Dutch and Boer both wrote and read in Dutch(or at least a broken dialect thereof). A prime example would be the "Staten bijbel"(A very popular Dutch bible) which a lot of families owned and which was used to teach children how to read and write. However, both Cape Dutch and Boer spoke different variations of Afrikaans. So Dutch was the written language, but Afrikaans was the spoken language. I'm only speculating here, but they may very well have used Dutch books. "Die Volksblad" was called "Het Volksblad" so the earlier versions of Afrikaans still had Dutch gender articles. It's absolutely possible to teach out of a Dutch book. My one subject's textbook is full of Dutch quotes from Dutch scientific journals. 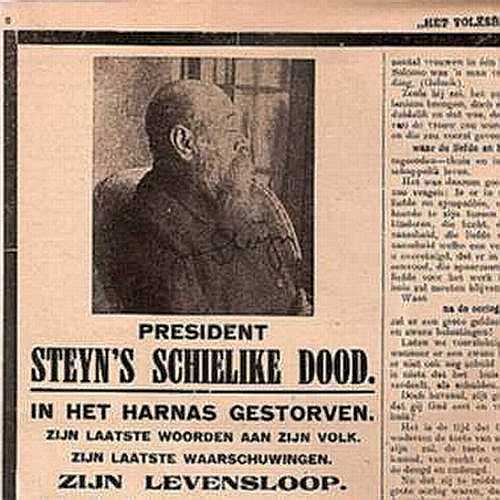 This edition of 'Het Volksblad" came out shortly after President Steyn's(of the Orange Free State) death. This was in 1916. It's definitely more on the Dutch side. Bittereinder wrote: This was in 1916. It's definitely more on the Dutch side. I can't read the small print on the right. Is there anything on this that obviously is NOT Dutch? I can make out much of this one, but I don't see any Afrikaans words or grammar. There's still "de/het/een" instead of "die/'n"(definite and indefinite articles). There's the "-en" suffix behind some words we don't have. There's the "g" where we typically have "ë" - "Regelingen". They're busy making a documentary on a group of Boers who emigrated to Argentina after the 2nd Anglo-Boer War. It's not done yet, but it looks like a big part of the research has to do with linguistics. They have a whole team there analyzing the language. It might provide some clarity over the written and spoken languages of the 19th century Boers. It looks to me that those pages from 'Het Volksblad' are in Dutch with 'spelling-Kollewijn'. That is a simplified spelling: schielike dood instead of schielijke dood, mens instead of mensch, Russies instead of Russisch. I think the grammar is also clearly Dutch: "De optocht begeeft zich vanaf het Kerkgebouw langs de Kerkstraat af naar .... I can't read further because it's unreadable. 'zich' is no longer used in Afrikaans, and the use of genders is wel illustrated in this sentence. Maybe if the quality of the pictures was better, we could find some hints of Afrikaans grammar. Weerwolf wrote: It looks to me that those pages from 'Het Volksblad' are in Dutch with 'spelling-Kollewijn'. That is a simplified spelling: schielike dood instead of schielijke dood, mens instead of mensch, Russies instead of Russisch. VOLKSBLAD, the oldest Afrikaans daily newspaper in South Africa, made its first appearance on 18 November 1904 in Potchefstroom in the form of Het Westen, a Dutch weekly with four pages with Hendrik de Graaf as the founder owner. 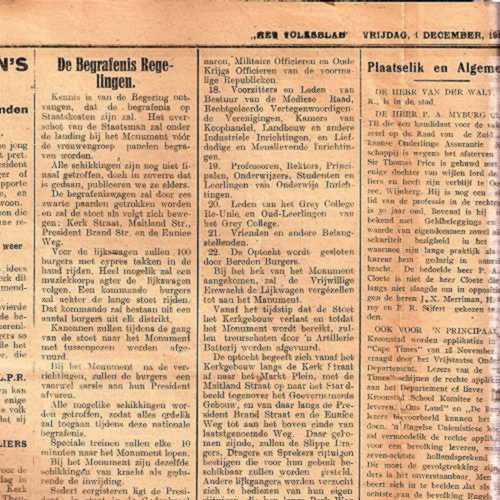 Seems like Volksblad used to be a Dutch newspaper, so it does not really resemble written Afrikaans. I've mentioned this somewhere before, but this is one of the only written Afrikaans manuscripts I know of. It has some traces of Dutch grammar in it, but it's also very close to Afrikaans. To get back to the original question, I believe it more likely that Dutch textbooks would have been used than Afrikaans. A lot of Afrikaans-speaking South Africans could also perfectly understand and speak English. I guess the real question would be: how did they teach Afrikaans? The Boers had public schools before Britain invaded, but all traces of Boer literature has been lost(perhaps purposely destroyed) throughout the years.